Comedy Dynamics announced today it will release the award-winning romantic comedy film (Romance) in the Digital Age from filmmaker Jason Michael Brescia on November 7, 2017 on iTunes, Google Play, Amazon, and major transactional services. 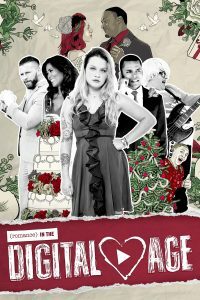 A former emo musician invites his ex-band mates to his Christmas-themed wedding, but when they sing a karaoke version of their biggest hit at the rehearsal dinner, the impromptu performance spawns a viral video that opens a door to the past. The film stars recording artist Lauren “LOLO” Prichard, Chris Warren Jr. (High School Musical), Brian Myers (WWE star Curt Hawkins) and Lauren Adams (Unbreakable Kimmy Schmidt). It is the third feature film by writer-director Jason Michael Brescia and features a soundtrack of original music featuring Warped Tour Veterans such as John Nolan (Taking Back Sunday), Zach Davidson (Vendetta Red), James Dewees (The Get Up Kids) and more.